Total Wine recently made a purchase for all of their Florida stores. Yep, they arranged to buy a full truckload of beer within distribution requirements so that Evolution Craft Brewing Co. out of Salisbury, MD could send four of their beers to The Sunshine State! And who said Santa doesn't work at a liquor store? I decided to start with their Lot No. 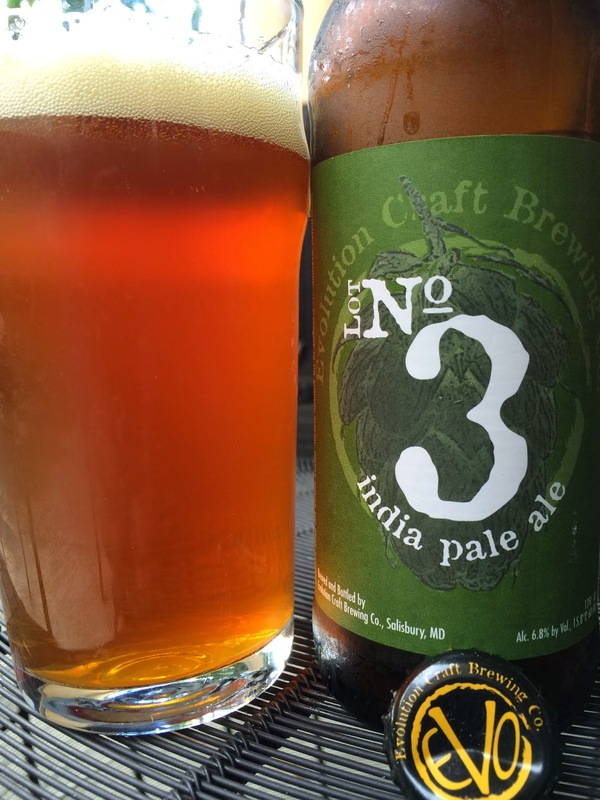 3 India Pale Ale. The label is very simple, just a green hop cone barely appearing on a green background. 6.8% alcohol, 15.8°P, 60 IBU. Very inviting aroma of candied orange citrus, some light tropical fruit and a good dose of pine. Fruity orange and a generic tropical flavor bring a nice sweetness to the start. But make no mistake that you're in for a big dose of pine bitterness which washes away any sweetness. Prickly carbonation and that bitterness rough up the palate a bit (in a good way). Fresh, spicy, hoppy. Pine lingers in the finish. Great beer! Keep your eyes open for a look at the others after I get a chance to try them.